There is tentative evidence that medical cannabis is effective at reducing posttraumatic stress disorder symptoms, but, as of 2017[update], there is insufficient evidence to confirm its effectiveness for this condition. There is serious suspicion among cardiologists, spurring research but falling short of definitive proof, that cannabis use has the potential to contribute to cardiovascular disease. 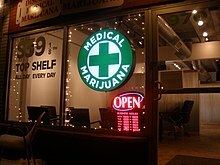 Cannabis is believed to be an aggravating factor in rare cases of arteritis, a serious condition that in some cases leads to amputation. Because 97% of case-reports also smoked tobacco, a formal association with cannabis could not be made. If cannabis arteritis turns out to be a distinct clinical entity, it might be the consequence of vasoconstrictor activity observed from delta-8-THC and delta-9-THC. Other serious cardiovascular events including myocardial infarction, stroke, sudden cardiac death, and cardiomyopathy have been reported to be temporally associated with cannabis use. 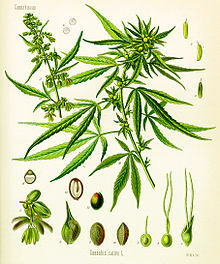 Research in these events is complicated because cannabis is often used in conjunction with tobacco, and drugs such as alcohol and cocaine. These putative effects can be taken in context of a wide range of cardiovascular phenomena regulated by the endocannabinoid system and an overall role of cannabis in causing decreased peripheral resistance and increased cardiac output, which potentially could pose a threat to those with cardiovascular disease. 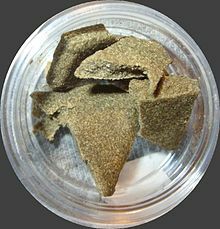 Smoking has been the means of administration of cannabis for many users, but it is not suitable for the use of cannabis as a medicine. It was the most common method of medical cannabis consumption in the US as of 2013[update]. It is difficult to predict the pharmacological response to cannabis because concentration of cannabinoids varies widely, as there are different ways of preparing it for consumption (smoked, applied as oils, eaten, infused into other foods, or drunk) and a lack of production controls. The potential for adverse effects from smoke inhalation makes smoking a less viable option than oral preparations. Cannabis vaporizers have gained popularity because of the perception among users that fewer harmful chemicals are ingested when components are inhaled via aerosol rather than smoke. Cannabinoid medicines are available in pill form (dronabinol and nabilone) and liquid extracts formulated into an oromucosal spray (nabiximols). Oral preparations are “problematic due to the uptake of cannabinoids into fatty tissue, from which they are released slowly, and the significant first-pass liver metabolism, which breaks down Δ9THC and contributes further to the variability of plasma concentrations”.